Jeff, you may need to start marking these panels as NSFW. 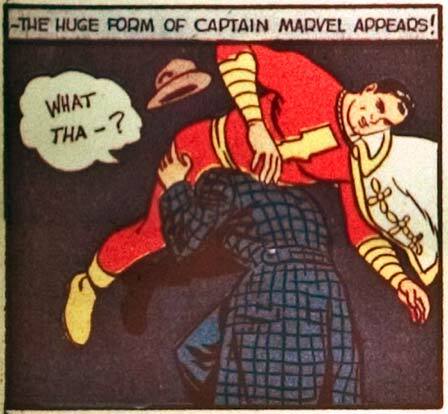 I’m not sure exactly what Captain Marvel is doing to that poor guy, but it’s either graphically violent or graphically obscene. I like to think it’s both, Cavalier. Huppa! Something is horibly wrong here. Or if you’re into thi sort of thing, horribly right. Off topic comment: Jeff, how goes progress on dresses, skirts, and whatnot? I have never in my life spent so much time looking at dresses. I’m getting cross-eyed. Cross-dresser-eyed? Whatever. Yes, it’s going well. It’s slow because each one dress turns into several actual items. Tops has the entire dress, just the top with sleeves (if any), and just the top without sleeves. The bottom is the bottom part of the dress only, but sometimes it’s in parts too. Or like I just did a series of skin-tight skirts in mini-, thigh-, calf-, and floor-length versions. The same for a looser fitting, flowing skirt. And so on. Thanks for the update, Jeff? Are bustiers, halter tops, tube tops, etc. going to be a separate category, or will they be part of dresses? Ok, so was this on the comic stand or the adult magazine stand?